As early as 1992, the Commission on Elections (Comelec) has identified the modernization of the electoral process as a goal of what was called Operation Modex (Modex for “Modernization and Excellence”). In the following year, Comelec commissioned foreign consultants to conduct studies on modernizing elections in the Philippines. Several Comelec officials also travelled to the United States to inspect the voting system there. A US company was chosen to supply canvassing equipment. No contract between the government and the supplier could be signed, however, pending the passage of a law on the use of a new election system. Meanwhile, Comelec conducted public demonstrations of the new system using two units on loan from the supplier. The change in administration in Comelec led to a repeat process of public bidding, and another supplier was chosen to provide the equipment that was later used in the pilot-testing of the new system in the 1996 ARMM Elections. The new equipment consisted of machines with optical mark recognition (OMR) capacities in scanning and tallying computerized ballots. Comelec personnel and ARMM field officials were trained to handle the whole electoral process. Results were determined just 48 to 72 hours after the end of Election Day on September 9. Demonstrations of the new system to the public followed suit. In 1997, RA 8436 was passed into law, authorizing Comelec to implement an automated system in the May 1998 elections, and in subsequent national and local elections. However, “lack of preparation, time and funding” led to the use of the automated process only in Lanao del Sur, Maguindanao, Sulu, and Tawi-Tawi in the 1998 elections. In 2001, the COMELEC’s failure to launch a public education campaign on the new election process led to the unintended exclusion of an estimated 3 to 6 million voters (Schaffer, 2009). By 2003, Comelec had started to build a centralized computer database of all registered voters, including digital photos, fingerprints, and signatures. “With $18 M worth of newly purchased data-capturing machines, the poll body had asked all registered voters to have their registration validated in order to purge the voters’ list of ineligible, fictitious, and double voters” (Schaffer, 2009). However, the scheme of validating the voters’ registrations crashed because the software used in the old voters’ list turned out to be incompatible with that of the new list. Many names disappeared when the two lists were merged. With the May 2004 elections fast approaching and a solution not in view, COMELEC hastily instructed their field officers to just use their own records. The use of an automated system in counting the votes was also stopped due to controversies of electoral fraud. The second nationwide automated elections will take place on May 13, 2013. In a report dated February 18, 2013, Automated Election System Watch (AES Watch) writes that in the 2013 elections, compact-flash or CF cards will still be used to store the software responsible for counting the votes and scans. CF cards, they say, are insecure, as these cards “can be transplanted with new data.”AES Watch also demands that the automated election system equipment, particularly the source code of the vote counting machines, be reviewed by political parties and other interested groups in order to ensure the credibility of the whole system. Aning, Jerome et al. “People heroes in poll success, say foreign observers.” Philippine Daily Inquirer. 14 May 2010. http://newsinfo.inquirer.net. Web. 8 May 2013. Automated Election System Watch (AES Watch). “A Primer on the Automated Election System in the Philippines.” 18 February 2013. Palatino, Mong. “Election Bugs.” The Diplomat. 15 May 2010. https://thediplomat.com. Web. 8 May 2013. Pazzibugan, Dona and Norman Bordadora. “SC: It’s all systems go.” Philippine Daily Inquirer. 8 may 2010. http://newsinfo.inquirer.net. Web. 8 May 2013. “Previous Elections.” Commission on Elections. Created 15 May 2012; Updated 16 July 2012. www.comelec.gov.ph. Web. 7 May 2013. Schaffer, Frederic Charles. 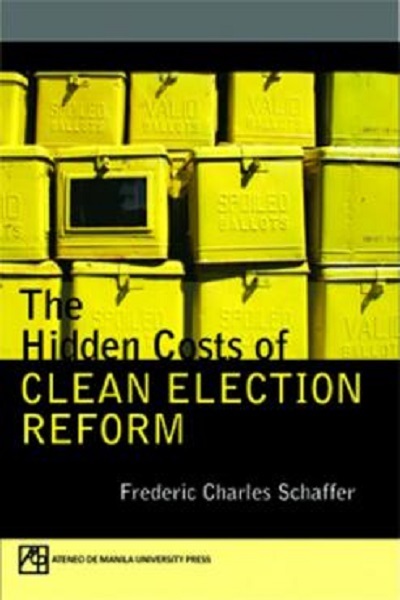 The Hidden Costs of Clean Election Reform. Quezon City: Ateneo de Manila University Press, 2009.